September 11, 2011 / New York -- On the tenth anniversary of the World Trade Center attacks, I felt compelled to do something other than sit at home and watch TV. Here I am, now a resident of Manhattan, less than 5 miles from ground zero so I needed to get down there. This was also the day that the 9/11 Memorial opened to the families of the victims. It was not possible to see the memorial in person but I knew I could get close. So around 2:00 PM I took off on a walk that I had scoped out on Google Maps. The plan was to head to Battery Park, about 4.4 miles, check things out and then take the train back. This is not what happened. I headed east from our house on West 49th St to 10th Avenue and headed south. When I got to 30th Street, I headed up onto the High Line and walked the entire length of that wonderful park to Gansevoort St. Then it was straight down Washington Street to Christopher Street where I headed over to the Hudson River Greenway. Continuing south, the views started changing quite a bit. The downtown skyline began to dominate as well as the large expanse of New York harbor with Ellis and Liberty Islands and New Jersey on the other side. Just before Chambers Street the trail jogs 90 degrees to the west past Stuyvesant High School, then cuts south again at Penny Park until arriving at a little yacht harbor and the gateway to the financial district. The World Trade Center is just on the other side of this complex. Just past this is the strangest thing I've seen in New York yet. I've since learned that it's the Irish Hunger Memorial. It's the foundation to a very old house on a small hill. However the under side of the hill is elevated and supported on a concrete shelf. To access the hill, you walk through a tunnel, under the hill, with many backlit encryptions embedded into it, and then wind a path through the rubble and remains up to the top. Next I was in view of the World Trade Center. I walked south along the west side to a pedestrian bridge seen many times on video footage throughout the years. It is an awesome, somber are. There is a strong feeling in the air of the seriousness of the events that happened here. I stood and just looked, soaking it in for several minutes. I was now in line to head east on Rector Street where I walked 2 or 3 blocks until Trinity Church on Trinity Street. Heading south from there took me straight down to Battery Park. Battery Park had thousands of special flags planted with the stripes being the names of the 9/11 victims rather than solid colors. Then I heard military music and investigated. 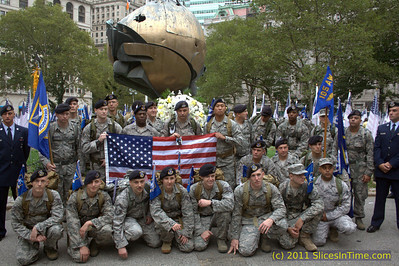 There was a group of about 20 Air Force soldiers in some sort of ceremony just in front of the WTC sculpture and eternal flame. I learned that this unit was the Ruck March to Remember and had left San Antonio in July and walked all the way from San Antonio Texas to New York via Shanksville, PA and Washington DC. This was their arrival ceremony. They layed a wreath in front of the eternal flame. Incredible to witness. Now that I was here, I was very much into the walk and decided that I wasn't ready to head home on the train and would try my luck at walking home, but via the East River rather than retracing my steps. So I embarked on this leg, heading out of Battery Park by the Statten Island Ferry terminal. I ended up on the wrong side of the FDR highway for awhile until I was finally able to get across to the walking and bicycle trail. At the South Street Seaport, I saw a Johnnie Rockets restaurant and couldn't resist, so stopped for a late lunch. North of there, after crossing under the Brooklyn Bridge, things got a little rougher looking along the lower east side, but everything was fine. I just powered my way north until 34th Street where the bikeway ends. There you have to jog over to 1st Ave (or any avenue) in order to continue north. I stayed on 1st Ave to the United Nations Headquarters where I jogged over to 2nd Avenue at 45th Street. Then 4 blocks later, I made the left onto 49th street for the last leg of the journey. There was an "A night of Remembrance" event in session there put on by the Turtle Bay Association. The final walk along E 49th Street was interesting. It's name is Katharine Hepburn Way and includes the Waldorf Astoria Hotel, Rockefeller Center, the north ends of Times Square and the Theater District. That completed the walk and a great, fullfilling day.